Also known as uterine artery embolisation (UAE), this approach to the treatment of fibroids blocks the arteries that supply blood to the fibroids causing them to shrink. All fibroids are usually supplied by the same branches of the uterine arteries regardless of their number. UFE is a minimally invasive procedure, which means it requires only a tiny nick in the skin, and is performed while the patient is conscious but sedated: drowsy and feeling no pain. During the procedure and immediately after you will be treated with appropriate pain-killing medication. What kind of doctor carries out the procedure? Fibroid embolisation is performed by an interventional radiologist, a physician who is specially trained to perform this and other minimally invasive procedures using image guidance. 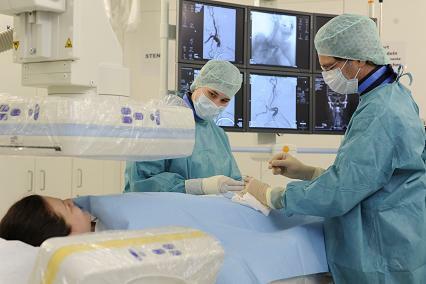 and medical imaging equipment to perform a wide range of procedures, including UFE.